Augusta and surrounding counties of Maine Christmas Tree Farms: choose-and-cut Christmas trees, Tree lots with pre-cut trees, stands, sleigh rides, hay rides and related winter events and fun! Whether you want to cut your own tree, pick a live tree and have it cut for you, buy a tree already cut or buy a living tree you can plant, this page provides detailed listings of Augusta and surrounding counties of Maine's choose-and-cut Christmas tree farms, places to buy pre-cut (also called pre-harvested and fresh-cut) trees, stands, sleigh rides, hay rides and related winter events and fun. Some listings are for tree farms, others are tree lots, and some only offer hay rides, sleigh rides or other winter events. READ EACH LISTING to know what each facility offers. The farms are listed further down this page, so scroll down the page! Since this service is free and open to ALL Christmas tree farms, not just those who belong to an association or pay for an ad, like almost all other websites do, this is the most complete and current listing available! I'm always looking for more to add, and to correct any inaccuracies or errors, so if you encounter any, please email me ! And please tell the farmer you visit in Augusta and surrounding counties of Maine that you found their farm here! I need the farmers to realize that you found them here so that they will keep their information up to date! Waterville, Maine, 04901. Phone: 207-680-2055. Open: Call for current date - usually around Thanksgiving. Come watch as A Touch of Country lights up Downtown Waterville with the Electric Christmas Parade. The parade brings Santa to town and ends with the lighting of the giant spruce in Castonguay Square. 125 Bowie Hill Road, Durham, ME 04222. Phone: 207-653-3319. Open: Cut Your Own by appointment only Monday through Friday 9 am to 4 pm and on weekends, from Friday after Thanksgiving until Christmas eve. Directions: Take Exit 22 off of I-295. Take Route 136 to Durham. Take a left at Davis Road at the Durham Get'n'Go. Bowie Hill Road is on the right. It is 1 mile down Bowie Hill Road. Click here for a map and directions. We use natural practices, but are not yet certified Organic. Payment: Cash, Check. Click here for our Facebook page . Wild, native organically grown balsam fir trees for your family celebration. Enjoy the best of nature and conservation this holiday season with a tree from our farm. 75 Dyer Road Lewiston, ME 04240. Phone: 207-577-5878. Email:edbdunroamin@gmail.com. Open: from 9 AM to 4 PM on weekends after Thanksgiving; we try to accommodate appointment requests as well call us for appointments. 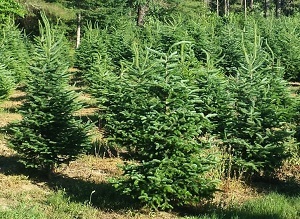 We have Balsam fir choose and cut trees, and also offer pre-cut trees as well. We often have boughs available with the purchase of a tree for further decorating. Dun Roamin' Trees Farms offers the true "Christmas Tree Experience", where you choose your tree as it grows in the field. It is a great family tradition to start the holiday season, and we offer as little or as much assistance as you would like in cutting, wrapping, and loading your chosen tree. For those who prefer less walking but still like the farm experience, we do also carry local fresh-cut pre-cut trees in different sizes. We have measurement sticks on site for you to match the measures of your room to your tree with. (they ALWAYS look shorter in the field) For those of you who like to decorate beyond having a beautiful tree, we offer free boughs for your use with the purchase of your tree. 75 Saunders Road, Greene, ME 04236. Phone: (207) 576-0541. Email: GagnonFamilyOrchard@yahoo.com. Open: Honor stand open daily 5 am to 8 pm for fruits and vegetables. Directions: 3 Miles past Mardens on Main street take a left on Saunders Road. 1/2 Mile from The Lewiston Maine town line. Click here for a map and directions. Open Summer through Fall usually August through Thanksgiving and sometimes Christmas; Haunted Hayrides at night for adults in the fall; Haunted Day rides for children in the fall; Fresh pressed 100% apple Cider Daily; Fresh hot Apple Cider Donuts and Chocolate donuts weekends; Yearly Family Festival every Fall. Payment: Cash, Check, Debit cards, Visa/MasterCard. Family Orchard for Family fun for All ages. Best Apple Cider and Cider Donuts around. Great haunted Dayrides for little ones and Haunted Hayrides through the woods for the Big kids. 2832 Turner Road, Auburn, ME 04210. Phone: 207-783-6986. Alternate Phone: 207-754-2142. Fax: 207-777-5275. Email: gammonlandscapenursery@roadrunner.com. Open: Monday 10 am to 6 pm; Tuesday closed; Wednesday closed; Thursday 10 am to 6 pm; Friday 10 am to 6 pm; Saturday 10 am to 6 pm; Sunday 10 am TO 6 pm. Directions: We are located on Route 4, 2832 Turner Road, just 2 miles past the Auburn Mall. We are on the left. Look for the large yellow watering can. Click here for a map and directions. Payment: Cash, Check, Debit cards, Visa/MasterCard, Discover. .
PreCut varieties: Austrian Pine, Balsam Fir, Eastern White Pine, Red Pine, Scotch Pine, White Pine, and other varieties (call!). Living, rooted tree varieties: Austrian Pine, Balsam Fir, Blue Spruce, Colorado Blue Spruce, Eastern Red Cedar, Eastern White Pine, Fraser Fir, Norway Spruce, Red Pine, Scotch Pine, White Fir (Concolor Fir), White Pine, White Spruce, and other varieties (call!). 28 Ridge Road, Wales, ME 04280. Phone: 207-933-4802 Email: gile@midmaine.com. Open: 9 am to 5 pm 7 days a week. Start a new Family Tradition!Choose n' Cut or Pre-Cut TreesTractor RidesHot Cider & Warm CookiesHeated Gift ShopWraths, Garland, Kissing Balls & more! 231 North Parish Road, Turner, ME 04282. Phone: 207-225-3382. Email: npctfarm@gmail.com. Open: from the Friday after Thanksgiving and then Fridays and Saturdays from, 9 to 4 pm; and Sundays from 12 to 4 pm while tree inventory lasts. We are continuing the operations as it was before - a choose and cut farm. Come cut your own balsam fir Christmas tree - $38 regardless of size! We sell trees, wreaths and garland, and gifts! We provide the bow saws and you can explore our eight acres of trees of various sizes. Once you find the tree for your Christmas tradition, we will bale your tree for you while you check out our selection of wreaths, kissing balls, garland, center pieces, our new line of body products, and many other gifts available in our shop. Click here for a link to our Facebook page. 192 Bowie Hill Road, Durham, ME 04222. Phone: (207) 926-3622. Alternate Phone: (207) 212-3621. Email: Dwr1026@cs.com. Open: December 1 - December 2 Saturday and Sunday, from 8 am to 4 pm pm. Directions: From Auburn take route 136 toward Freeport. Right on Stackpole Road. Follow 2.7 miles. Left onto Bowie Hill Road. We are on the Right one mile in. Look for Rice Tree Farm Sign. From Freeport take route 136 toward Auburn. Left on Davis Road just passed the gas station. Take third right onto Bowie Hill Road. We are on the LEFT just over the second crest in the road. Look for the Rice Tree Farm sign.v. Click here for a map and directions. Payment: Cash, Check. 424 Hanson Road, South China, ME 04358. Phone: (207) 877-5487. Email: benandmollystreefarm@yahoo.com. Open: Ben and Molly's Christmas Tree Farm Friday to Sunday from 8 am to 5 pm, November 24,25,26 December 1,2,3 December 8,9,10 December 15, 16,17 December 22,23 �" 2017. Click here for current open hours, days and dates. Updates: Click here for updates. Directions: From Route #3, turn on to the Hanson Road, drive 2.25 miles, go around a 90 degree curve, Farm is on the left. From Route #9/202/Lakeview Drive, turn on to the Cross Road, turn left on to the Hanson Road, 25 miles, go around a 90 degree curve, Farm is on the left. Click here for a map and directions. Payment: Cash, Check, Debit cards, Visa/MasterCard, Discover. Click here for our Facebook page. Be sure to take advantage of Ben and Molly's hospitality!- Free Hot Chocolate and Cookies at the Christmas Tree Farm and new Christmas Tree Shop. 208 Back Street, North Monmouth, ME 04265. Phone: (207) 212-0056 . Email: cbgmbrown@gmail.com. Open: Friday from 12 pm to 4 pm, Saturday and Sunday 9 am to 4 pm, Thanksgiving to Christmas. Directions: One mile from Route 202 on Back Street, follow signs. Click here for a map and directions. Payment: Cash, Check. 214 China Road, Albion, ME 04910. Phone: 207-453-6467. Email: nnadeau4@roadrunner.com. Open: Fridays 10 am to 5 pm, Saturdays 9 am to 5 pm, Sundays 9 am to 4 pm, from November 25th thru December 18th. Directions: Click here for a map and directions. Payment: Cash, Check, Debit cards, Visa/MasterCard, Discover. Homemade Christmas tree shaped cookies FREE to all children. 118 Prescott Hill Rd, Monmouth, ME 04259. Phone: 207-933-8000. Alternate Phone: 207-740-1500. Fax: 207-933-9895. Email: iceauger@fairpoint.net. Open: Friday, Saturday and Sunday from 9 am to 4 pm; Weekdays call for an appointment. Directions: Click here for a map and directions. Payment: Cash, only. 976 Albion Road, Winslow, ME 04901. Phone: 207-649-2087. Email: dmharchery@yahoo.com. Open: Starting the Saturday and Sunday after Thanksgiving, 9 am to Dark; Weekdays, 2:30pm to Dark. Click here for current open hours, days and dates. Directions: Click here for a map and directions. Payment: Cash, Check. Click here for our Facebook page. 54 Crosby Rd, Albion, ME 04910. Phone: (207) 660-7275. Alternate Phone: (207) 313-9584. Email: alfloh@gmail.com. Open: staring Friday after Thanksgiving, Monday through Friday 2:30 pm until dark Satuday and Sunday 9 am until dark.. Directions: Click here for a map and directions. Payment: Cash, Check, Debit cards, Visa/MasterCard. 159 Moose Hill Road, Fayette, ME 04349. Phone: 207-897-3093. Email: joe@moosehillherbs.com. Open: Monday to Friday from Noon until dark; Saturday and Sunday from 9 am until dark; Open seven days a week from the day after Thanksgiving for 3 weekends only. Directions: Click here for a map and directions. Payment: Cash, Check, Debit cards, Visa/MasterCard. You-Choose and You-Cut varieties: Balsam Fir, Blue Spruce, Douglas Fir. 434 Legion Park Road, Vassalboro, ME 04989. Phone: 207-445-3023. Email: FZMIGRODSKI@AOL.COM. Open: Friday, Saturday and Sunday from day after Thanksgiving to Sunday before Christmas from 10 am to 4 pm. Directions: From I-95, take exit 113 and follow Route202/3, 10.1 miles, to Legion Park Road. Turn right onto Legion Park Road. Oldfield Farm is .8 mile on your right. From the Waterville area: Take SH 32 south to Route 3. Turn right, west, on Route 3. Follow Route 2 miles to Legion Park Rd., at the top of the hill. Turn left onto Legion Park Road. Travel .8 mile, Oldfield Farm is your right. Oldfield Farm is a family run christmas tree plantation dedicated to the culture of fine evergreen trees for display during the Christmas Holiday. By offering the trees that customers choose and cut themselves the choicest and freshest trees are made available. The current planting covers 4.5 acres and includes balsam and frazier fir trees, up to eight feet in height. A timber frame barn, which in the future will serve as a gift shop and warming room, is currently under construction. This building was successfully errected on August 4, 2012 with the generous help of family and friends. Hardy, lush Canaan firs are also available. In addition to Christmas trees we are offering Maine made wreaths at reasonable prices. Our timber frame gift shop will offer hand made mittens and traditional wooden toys also at reasonable prices. Stop in, warm up, and check the "stocking stuffer" items. Oldfield Farm does not have a baling machine for your tree so either bring your pickup truck, pull a trailer, or arrange for a roof top carry. As always, assistance is available for those who need help cutting their tree. 183 Pond Road, Mount Vernon, ME 04352. Phone: 207-242-8763. Email: jwiles@earthlink.net. Open: Day after Thanksgiving to Christmas Tuesday to Saturday 9 am to 5. Directions: 1/4 mile north of Mount Vernon Village on Route 41. Click here for a map and directions. Pick your own patches will be available during the 2011 Fall crops; Will be available Monday-Saturday 9 am to 5 pm; You can reserve a spot by calling for an appointment. We do not use pesticides on the crops. Payment: Cash, Check. Only take local checks. Otherwise CASH ONLY. Nelson Road, Vassalboro, ME 04989. Phone: 207-445-4827. Email: Open: from Saturday after Thanksgiving on Saturdays and Sundays only from 8:30am to 4 pm. We have a great selection of Balsam Firs in all sizes. We also have hand made wreaths. RR 3 Box 6630, Fayette, ME 04349. Phone: 207-897-3093. Email: mooshil@ctel.net. 214 China Rd, Albion, ME 04910. Phone: (207) 437-8733. Alternate Phone: (207) 453-6467. Email: nnadeau4@roadrunner.com. Open: Starting the day after Thanksgiving and close the Saturday before Christmas, Friday 10 am to 5 pm, Saturday 9 am to 5 pm and Sunday 9 am to 4 pm. Directions: Click here for a map and directions. Payment: Cash, Check, Debit cards, Visa/MasterCard, Discover. Kissing balls, wreaths in many shapes, centerpieces, decorations for your tree and home, honey and maple syrup from local businesses, homemade gifts and free cookies for all children. Our farm is currently developing and the first crop of beautiful trees are nearly ready. We plan to open for the 2019 holiday season and look forward to seeing you then! 263 Hopkins Road, Washington, ME 04574. Phone: 207-845-2544. Email: lrfreiman@gmail.com. Directions: Hopkins Road is South of Route 17, between Route 17 and Route 126, halfway between Augusta and Rockland, in the town of Washington. Open: Friday, Saturday and Sunday Thanksgiving to Xmas, 8 am to dark. Payment: Cash, Check. Click here for our Facebook page. 2500 Winslows Mills Rd Route 32 North, Jefferson Side, Waldoboro, ME 04572. Phone: 207-832-5385. Alternate Phone: 207-832-7576. Email: dave@wreathsofmaine.com. Open: First Saturday after Thanksgiving and every Saturday and Sunday until Christmas 10 am to 4 pm We offer Self service during the week. Directions: From Route 1 Waldoboro, go North on Route 32 4.7 Miles Entrance is on Left. From Jefferson go South on Route 32 3.8 miles from the Damariscotta State Park Entrance is on right just past the Orff's Corner Church. Click here for a map and directions. We use natural practices, but are not seeking organic certification. Payment: Cash, Check, Visa/MasterCard, Discover, AmEx. Also called "Wreaths of Maine". Living, rooted tree varieties: Balsam Fir, Blue Spruce, Norway Spruce, White Pine. PO Box 126, Nobleboro, ME 04555. Phone: 207-563-5700. Email: timberlandconsultants@tidewater.net. Open: Saturday and Sunday 9 am to 4 pm. Directions: 1/4 mile off US RT 1 on Back Meadow Road, Nobleboro, just down hill from the telephone company. sales at Damariscotta Hardware, Upper Main St. Damariscotta. 663 South 27th Boothbay Road, Edgecomb, ME 04556. Phone: 207882-6063 or 207-882-8010. Email: pfredptrees@yahoo.com. Directions: From Route 1 Wiscasset go east to Route 27. Turn right heading for Boothbay Harbor. We are 3 miles from Route 1 on right hand side of Road. Open: Christmas season 9 am to 4 pm. 20 Varney Mill Rd, Bath, ME 04530. Phone: 207-443-5944. Open: 9 am to 4 pm. on the following Saturdays and Sundays: December 1 and 2, 2018; December 8 and 9, 2018. Directions: From U.S. Route 1, take the West Bath exit. At the end of the ramp, turn right (north) on New Meadows Road. After about 1 mile, jog a few feet to the right and then turn left to continue north on Ridge Road. At the end of Ridge Road, in about 2.1 miles, turn right on North Bath Road. After 0.2 miles, turn left on Varney Mill Road. Hummer Tree Farm will be on your left in about 200 feet.. Click here for a link to our Facebook page. 281 Belmont Avenue, Belfast, ME 04915. Phone: 207-338-6098. Open: the day after Thanksgiving. Directions: 3 miles West of Belfast on Route 3 Intersection of Rte 3 and Jessie Robbins Rd. Find us on Facebook. Disregard google map location!. We have also put in a new retaining wall and moved our shaker and bailers down below it so it will be much easier to have your trees bailed. Plus you may set up on top and watch our guys while doing your tree. Lots of new things in the shop this year and we are sure everyone will still enjoy looking at our animated village that lights up while things all move about. That is right next to the nice warm wood stove which with our Maine weather makes it nice and cozy after cutting your tree. Be sure and enjoy a cup of hot chocolate and candy cane while you enjoy your experience of Christmas in Maine. Looking forward to your visit. Box 29, Unity, ME 04988. Phone: 207948-2125. Email: areed@uninets.net. Route 7, Brooks, ME 04921. Phone: 207-548-2221. Email: kasjr@verizon.net. Directions: Located on the west side of Route 7, two miles south of Brooks village or 8 miles north of Belfast. And for a map to our farm, click here. Open: Saturdays and Sundays 10 am to 4 pm. Open for Christmas trees from day after Thanksgiving to the second weekend in December. Payment: Cash, Check.